The following review contains spoilers for any number of previous Discworld novels. Every cop show has an obligatory “get stuck doing cop stuff while on vacation”. This apparently happens on the Discworld as well, because, in Terry Pratchett’s latest novel, Snuff, Commander Sir Duke Blackboard Monitor Samuel Vimes goes on vacation and ends up uncovering a pretty huge crime. Snuff occurs about three years after Thud, the last City Watch-centric novel. Vimes’s son Sam (referred to herein as “Young Sam”, as per the book) is now six years old and, like all six-year-olds, is obsessed with poo. A trip to the Ramkin (Vimes’s wife comes from an absurdly rich family) estate, which is in the general vicinity of Quirm (think Paris), should afford Vimes and Lady Sybil a nice vacation, and will also give Young Sam the opportunity to examine many new varieties of poo. Also joining them is Willikins, Vimes’s personal butler/batman, who we’ve learned from previous books is not quite as pressed and proper as one might think. The first third of the book is, in my opinion, the best of it. There’s a lot of rather typical Vimes-out-of-water moments, a lot of funny stuff with Young Sam and poo, and some good lines for Willikins as he takes on the role of Mr. Exposition (Willikins has been with the Ramkin family for many years). But, as is wont to happen with policeman-on-vacation stories, Vimes stumbles onto several crimes, including a murder, smuggling, and slavery. Without the support of any Watchmen from back in Ankh-Morpork, Vimes must figure out what’s going on, unravel both the low crimes and the high crimes, and not actually break the law in the process. And, just in case you were worried, we also get a touch of Vetinari; some scenes with Carrot, Angua, Cheery, A.E. Pessimal, Fred, Nobby, and Constable Haddock; and even a Nac Mac Feegle in the form of Constable Wee Mad Arthur. One of the major points of Snuff is to bring to light the plight of the goblins, a race of beings thought to be the lowest of the low. But, as with most races like that in Discworld (starting with the trolls, way back in The Light Fantastic), Vimes discovers that there’s a lot more to goblins than he — or anyone else — thought. And once he learns this, he becomes quite put-out that someone is transporting and enslaving the goblins to harvest tobacco in a far-off land. When Vimes gets put-out, things get done. The second act of Snuff is stuff we’ve done before — Vimes training up a new constable (Guards! Guards! ), Vimes investigating crimes against a race previously thought to be unworthy (Feet of Clay), Vimes using his cunning and experience to overcome the odds (The Fifth Elephant), and Vimes subverting the status quo in ways that shouldn’t work, but somehow do anyway (Jingo). It’s still funny and interesting, but it’s not new. Act Three is the obligatory “chase the bad guy” sequence, and a lot of action occurs. I won’t spoil it for you, except to say that the word “damn” is used a lot. As I said before, Act One really is the best part of the book, because we’re being reintroduced to characters we haven’t spent a lot of time with since 2005’s Thud. Plus, at that point the story is simple: Vimes is going on vacation with his son. Once we get into Act Two, we get a lot of the same old Vimes-isms we’ve been getting since 1996’s Feet of Clay. I also thought the story started to get a little muddled at that point, and a little too overcomplicated. Terry Pratchett, as is widely known, suffers from posterior cortical atrophy, a rare form of early-onset Alzheimer’s that affects his motor skills but not his mental faculties. As a result, he must write via dictation, either to his assistant or to a computer. I’m not a professional writer*, but I do know that I have a much more difficult time writing if I try to dictate a story than if I actually type or write it. My guess is that Pratchett has overcome this issue, although it seems to me that the tone of the books has changed slightly, become more urgent. In 2009’s Unseen Academicals I observed a lot of the same type of plot overcomplications as in Snuff and noted in my review of I Shall Wear Midnight — Pratchett’s previous novel — that it felt as though he was trying to shoehorn in all the ideas he’s wanted to address in future Discworld books but feared he would be unable to do due to his illness. I didn’t observe quite as much of that in Snuff, but there was still attention paid to things that I thought took away from the story. Examples include Vetinari finally finding out who writes the Times crossword puzzles, Lady Sybil using her influence to make a change in the world, and Willikins revealing to the audience what Vimes already knows: that he’s much more than your average batman**. These are all subtopics that really could have their own book, or at least their own primary subplot, but they seemed unnecessary — although certainly well-written and well-integrated into the plot of Snuff. Kill, as in a snuff film. Un-light, as in snuffing out a candle. Some of these things did happen in the book, but I’ve got to think there was a better title out there somewhere. Snuff just… didn’t fit. Not to me. Despite all of these concerns, I don’t want you to think that Snuff isn’t a good book, because it most definitely is. Pratchett’s customary humor and wit are present throughout, and the writing remains as wonderful as ever. My inner 12-year-old appreciated all the poo references, and if we’ve already done the goblin thing back when Vimes visited the Low King, at least it’s done well again. 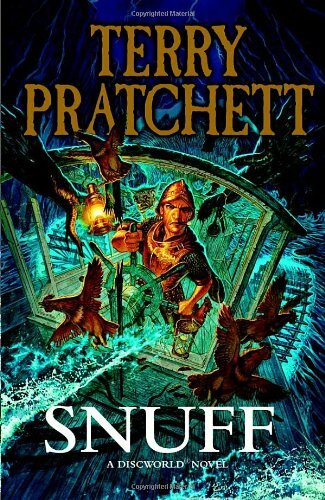 Snuff isn’t going to make the list of my favorite Discworld novels***, but I certainly enjoyed it and am looking forward to the next one. Note to Parents: I’d rate this book PG. There’s some violence, and some mild language, and a couple of non-explicit sexual situations (Vimes and Lady Sybil are married, after all). However, it’s nothing worse than what you might see on an episode of House or Smallville. Of course, you should use your own discretion when it comes to your children. ** Don’t get too excited; he isn’t a superhero. Although that would be an interesting thing to address in a future Discworld novel. *** 10. Jingo. 9: The Truth. 8: Reaper Man. 7: Maskerade. 6: Small Gods. 5: Moving Pictures. 4: Lords and Ladies. 3: Soul Music. 2: Feet of Clay. 1: Men at Arms. The world of genre fiction was dealt a serious blow when author Terry Pratchett announced that he suffered from early-onset Alzheimer’s disease. It didn’t stop him from writing, but it may have moved up the end of his writing career. His previous Discworld novel, “Unseen Academicals”, was – to my mind, anyway – full of plots and ideas that Pratchett may have wanted to cover in future novels but was afraid he wouldn’t be able to. I thought it made the book suffer. Not so much with “I Shall Wear Midnight”, the latest – and possibly the last, depending upon the progress of Pratchett’s illness – Tiffany Aching novel. “Midnight” begins when Tiffany is 16, and has taken on the mantle of the witch of the Chalk, a land in Discworld relatively close to Lancre. She does all the mucky jobs witches do – birthing babies, seeing to the sick, laying out the dead, and generally living and working near the edge. Early on, we are shown just how well Tiffany has learned her craft from Granny Weatherwax, “the most highly regarded of the leaders [witches] didn’t have” (“Wyrd Sisters”) when she has to deal with Seth Petty, who has beaten his pregnant teenage daughter so severely that she lost the baby. And there we have the first insight that “Midnight”, while being a YA novel and shelved as such in many bookstores, is not for the immature. The thing is, after having read the book, that sequence is the most graphic and adult in the novel. To me it served a similar purpose to Shepherd Book’s death in “Serenity” – a character will be killed off, to show how serious this is. There’s a scene or two later in the book that reminds us, but it doesn’t hold a candle to what Seth Petty did. I think we needed it, too, because the novel’s main villain, the Cunning Man – the spirit of a long-dead priest of Omnianism, a religion established in “Small Gods” and referred to many times throughout the series – is somewhat hard to wrap one’s head around. We’re told he comes back every few hundred years, and he fights the witches, and the witches generally win. He came back this time because Tiffany kissed the Wintersmith (in the book of the same name) and drew enough attention to herself. The Cunning Man is the kind of villain that works well for a YA audience because it makes people do things they normally wouldn’t, against their will – similar to the hiver in “A Hat Full of Sky” – but it makes the book a little difficult to follow when it comes to the main plot. It’s like “Harry Potter and the Half-Blood Prince”: Harry has the Dursleys, school, Quidditch, the Voldemort War, being in love with Ginny, and he has to deal with the whole Voldemort thing… but that last one gets lost in the shuffle amid all the other story arcs. The same with “Midnight” – Tiffany has to handle a lot of things in this book besides the Cunning Man, including caring for the people of the Chalk, the imminent marriage of her friend Roland (son of the Baron), the Duchess’s treatment of her people, and Amber Petty (Seth’s daughter), who seems to really like the Nac Mac Feegle. Oh, yes. The Feegles are back – Rob Anybody, Jeannie the Kelda, and fan favorite, Daft Wullie. Rob even puts aside his Feegle nature for a moment when the Baron’s men threaten their mound. It’s quite a moment. And speaking of people who are back, one of the best parts of the book is when Tiffany meets Granny Weatherwax’s other successful apprentice. “Midnight” brings us all our favorite witches – Granny, Nanny, and even Magrat, along with mentions of Tiffany’s friends Petulia and Anagramma, and her teacher Miss Tick – as well as introducing Mrs. Proust, who has a very surprising connection to Boffo (see “Wintersmith”). Tiffany also meets Captains Carrot and Angua (glad to see she’s finally gotten that promotion), Constable Haddock, and the inimitable Commander Vimes. But the book takes place on the Chalk, for the most part, and despite the attendance of the senior witches – one of whom (and you can easily guess which) has fought the Cunning Man before – it’s Tiffany who must save the day. I’ll be honest: I really didn’t care for “The Wee Free Men”, but the rest of the Aching books have been good, solid stories, and if this one meandered a bit and did contain a tad too much additional plot (Miss Smith, the Duchess and Leticia, Tiffany Goes to Ankh-Morpork – which really felt shoehorned in there), Pratchett is still a good enough storyteller to tie it up neatly at the end. If “I Shall Wear Midnight” turns out to be the final Tiffany Aching novel, then I for one am satisfied with how her arc ends. Besides, that means we can get back to the business of making Vimes the next Patrician*. * Oh, come on, you know that’s how the Discworld series will end.